Medieval history and hack and slash games are among my favorite things, so I was glad to discover Knights of the Temple on PS2. 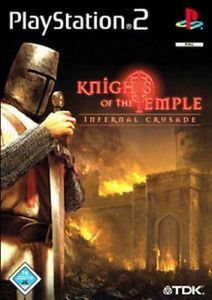 The story is about Paul, an idealistic new member of the famous Knights of the Temple, a powerful group of warriors established during the Crusades. Paul finds out his beloved Adelle has been kidnapped by the corrupted bishop of Belmont, who plans to bring hell on Earth by performing a diabolical ritual. Unfortunately, what follows teaches you nothing about the Templars and the plot is simplistic and uninteresting. 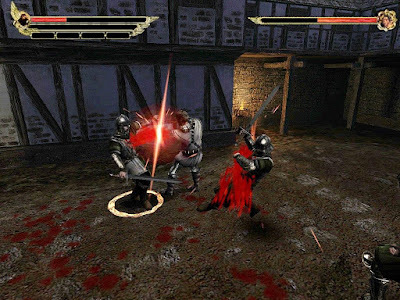 Knights of the Temple is a pure hack and slash game: Paul massacres enemies in melee combat, using swords, maces and axes (there is also a bow that is rarely used); the action is fast and enjoyable, making you feel like a human killing machine. Besides melee attacks, which can be combined, you gradually acquire spells and special moves (eight in total). Spells can heal you, make you invulnerable or hurt enemies; they consume magical energy, accumulated by killing adversaries. Special moves break through defenses or deal extra damage; they require stamina, which is replenished very quickly automatically. There are a few puzzles too, like changing the water level in the sewers or rotating zodiac symbols on a map to open a gate. The level design is linear, however some side rooms contain health items, spell upgrades or new weapons. The atmosphere of the first level is fantastic, as you fight in narrow stone corridors against possessed monks who wield scythes and move like puppets with broken strings. In the desolate town of Belmont you are attacked by armored thugs and escape through the harbor. Afterwards, you travel to the city Acre, where you battle in yards against Saracens with turbans and curvy swords. Then you go to sacred Jerusalem, Petra, a giant monument carved in stone, the lava pits of hell (which makes no sense at all) and Belmont, again. 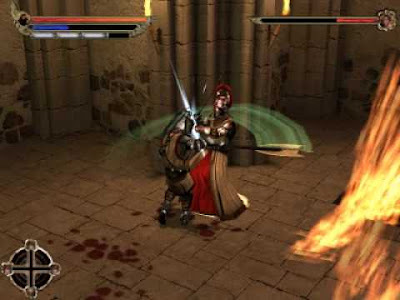 Technically, the game is nothing special: few colors are used, for example you see lots of grey and brown at Belmont, and the PS2 textures are a bit unclear and blurry. What I did not like is that after Acre you see the same scenery and enemies often; in addition, Jerusalem is reduced to a series of generic yards and buildings with countless doors you cannot open. The sound contributes to a sense of dread when you are in the monastery and changes appropriately in the Middle East. The controls are perfect, making combat easy to handle and fun. The face buttons are for melee attacks, blocking (essential) and interacting with the environment. You save at the end of a stage and there are save points too, which can be used only once. 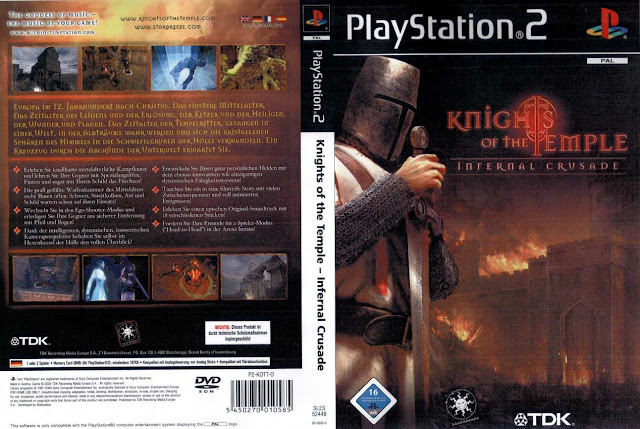 In general, Knights of the Temple offered a mixed experience: I loved the bloody action and dark atmosphere but the second half is less good and the ending is disappointing. Fans of medieval themes and the hack and slash genre may be interested in it.